Hard to believe another year is gone. 2017 was a wild ride–and ended like a five-star theme park attraction. I’m seriously hoping for a much calmer 2018. 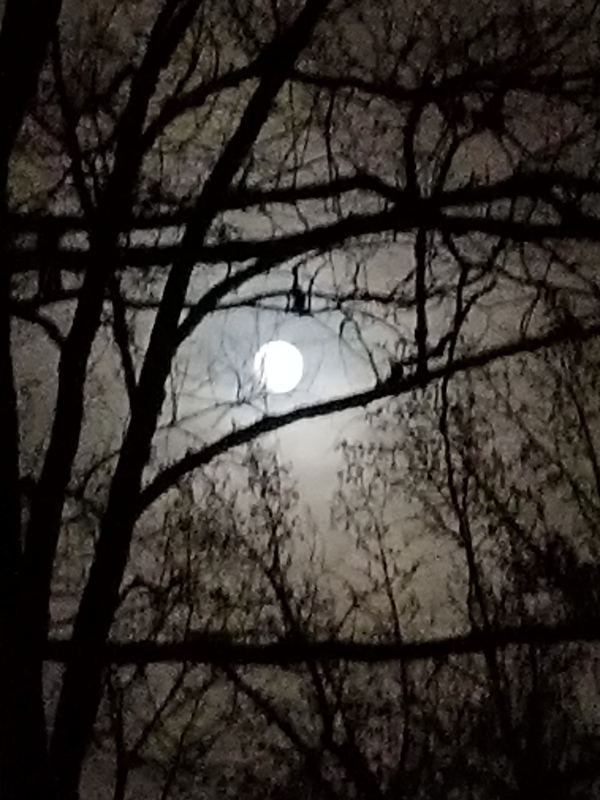 I loved the full moon tonight (though my cell phone doesn’t take the best night photos). My New Year’s traditions are tame. My husband’s work schedule often had him working either New Year’s Eve or New Year’s Day, and usually had to go to bed early. As the mother of two, my “New Year’s Eve celebrations often consisted of trying desperately to stay up until midnight long enough to say “Happy New Year!” to myself, followed by desperately trying to keep my kids from attempting to stay up until midnight; to appreciating them trying to stay up with me. I’ve never really done the wild party scene. Some folks in my neighborhood set off fireworks throughout the day/night; it’s more annoying than celebratory–and sets off the dogs. The kids are now teenagers, and will be looking for their own celebrations far too soon. I tell myself some day I will throw my own party–not this year; maybe next. Wow, I cannot believe what a fabulous year 2018 turned out to be. Who would have imagined?! It started off successfully when I cleaned out all the plasticware that had been taking up space, and found most of the missing lids as well–that let me donate the entire batch to charity. That opened up enough space that I rearranged everything and it is so much more efficient, I’ve started cooking again. That has an unexpected side effect–I’m down two sizes! Not only am I eating more healthily, I’ve got the energy to start using the stationary bike. I’m listening to books on tape while I exercise, which is giving me plenty of inspiration for my writing. I couldn’t believe how nice the people in my local RWA chapter are–I not only joined, I’m volunteering. And I’ve taken a couple of amazing workshops that helped me get my book finished. Now I’m interviewing editors and hope to have it out shortly! This year has been amazing! It’s positive, upbeat, and shows SUCCESS. Note I said HAND WRITE. As in long-hand. Pen and paper. Not just typing it on the computer. This is one of those psychological tricks you’re playing on your brain. If you’ve read any Jack Canfield or Notes from The Universe, you’ll get the idea. What you’re doing is telling your brain all this good stuff has already happened. Yet, your brain “knows” that it hasn’t. So, the subconscious solution is to start finding tons of ways to make all this great stuff happen. Because clearly, it already has. It’s odd, but I find that I’m more successful with this technique than with intimidating lists. And for New Year’s Day, I have previously provided the recipe for a blackeyed pea dip. 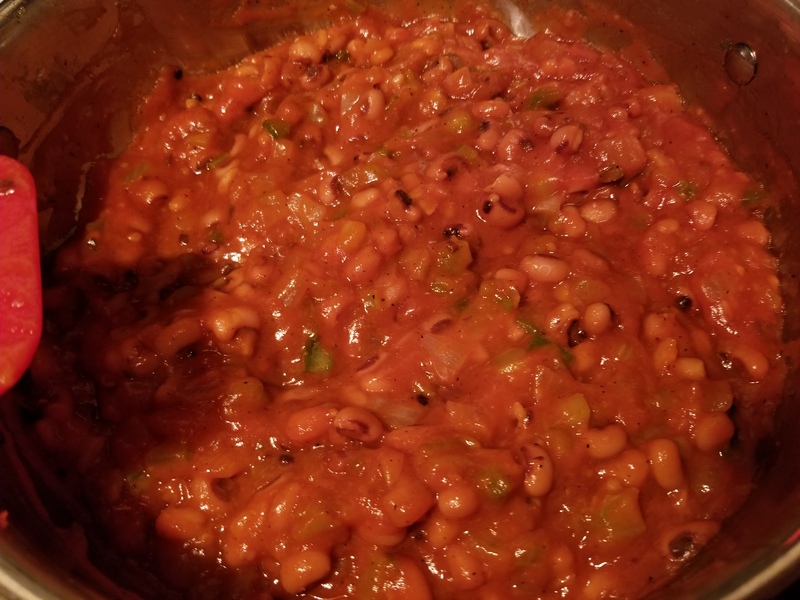 https://wp.me/p2jJ14-2y I think it’s a Southern tradition that says if you eat blackeyed peas on New Year’s Day, you’ll have luck all year. As I kid, I always used to mutter, “Maybe it’s just if you eat it on the first day, nothing worse can happen to you the rest of the year.” I was NOT a fan of blackeyed peas in any format. I also don’t like spicy stuff. This recipe is both. And I LOVE it. A former boss brought it in after the Christmas/New Year’s break one year, and I was a total convert. Easy to make–you can cut it in half if you don’t have a big crowd. I haven’t tried doubling it–it makes a good amount. Enjoy! !